RV Hex Surrounds - Made to fit and complement RV hex-shaped shower bases. Lightly textured material allows for easy cleaning, and helps prevent scuffs and scratches. The sides are 32" or 34" depending on which finish you choose. The height is 65". An RV bathroom is normally fixed with a toilet, sink, tub and a shower. 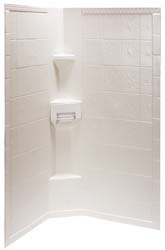 Under the soothing rush of water from an RV shower is what you will need to relax after a tough day behind the wheel. Lyons RV Showers come in many styles and designs. *884202 - White/Smooth, 32" x 32" x 65"
*884204 - Parchment/Smooth, 32" x 32" x 65"